Welcome to Iris Basics, where you can find answers to your questions about irises. You’ve never grown them before? You have a brown thumb? You’re not sure where to start? We can help! Choose an area below and you’ll find loads of information at your fingertips. You’ll have a beautiful iris garden in no time! Parts of an Iris: here are several illustrations that show the various parts of a bearded iris. 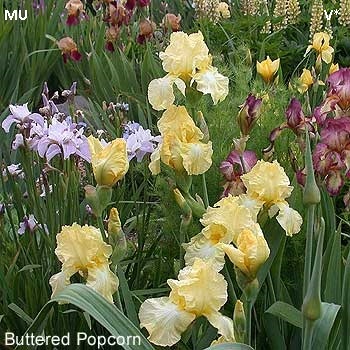 Bearded Iris Classifications: the AIS website has a great overview of the different classes of bearded irises. They come in all sizes! Iris Colors and Patterns: what’s a variegata, or an amoena, or a bitone? Find out here. Getting Started: selecting a site, preparing the area, and growing in raised beds and pots. Choosing Your Irises: how to select irises, various types of garden beds, and where to get the irises you want. Planting and Caring for Your Irises: information on planting, watering, fertilizing, etc. Unwanted Guests: dealing with iris pests and diseases. Dividing and Sharing: how to divide irises and replant them, and where to share the divisions. Companion Plants: what grows well with irises?